In this, the Banner Year of Sword Art Online, with two anime projects on the horizon, at least two new contenders shall challenge the theme song throne. One of them premieres this Sunday. Before then, let’s look at the golden standard against which it will be judged. Barely a second after the opening bars to LiSA’s “Crossing Field” gave way to its first verse, the musical identity of every successive opening theme was instantly set in stone. That moment was such a potent blast of iconic perfection, that no one could argue that SAO somehow did not sound exactly like that. It has left numerous fast-driving, string-heavy, female-fronted pop-rock theme songs in its wake since then. But how does one follow up such an act to be its equal, or maybe even surpass it? The second OP, “Innocence” from Eir Aoi, decided to try being, more or less, the first one again, but with a more complex instrumental bridge...and without an equally strong kick-off. Also, her deeper voice doesn’t fit this type of song as well as LiSA’s energetic higher timbre. Valiant though the attempt may be, solid though the theme is, it doesn’t match up to the original. That wasn’t the end of it for Eir Aoi, however. With the first opening of SAO’s second season, she got to contribute a second time! And she brings the goods in a major way. 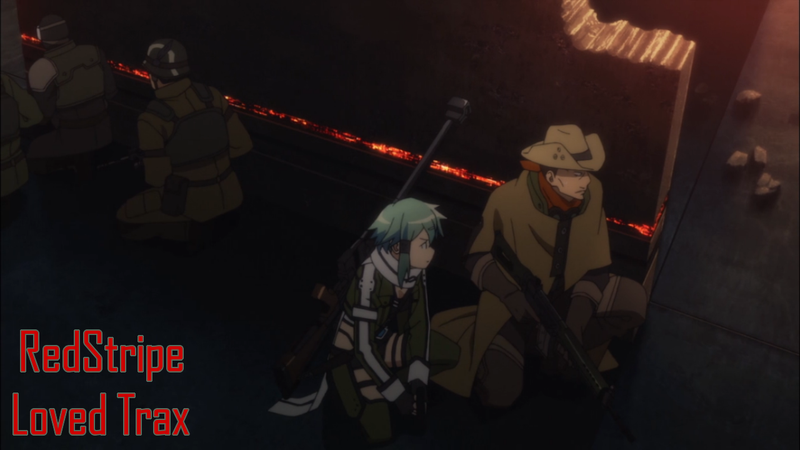 “It’s still Sword Art Online but this time we’re in a post-apocalyptic science fiction shooter” is the kind of feeling that should have been hard to convey, let alone convey musically well, but this totally nails it. “Ignite” surpasses the first OP. It’s my favorite theme. Yet when first hearing it, I did not think that much of it. Not bad by any means, but it also didn’t stand out all that much. In retrospect, that was probably because it didn’t have another few opening seconds that packs the mother of all punches. On successive listens, though, something intriguing began happening: I was liking it more and more. Eventually, that snowballed into seriously loving it. This song is not about the immediate first impression like a certain “Crossing Field”. In fact, even while staying within the SAO opener genre-unto-itself, it’s a deceptively significant departure from that classic OP. In place of the pomp and circumstance is a darker, more foreboding, and subtly sci-fi atmosphere. The singing betrays urgency and desperation well beyond its forebears. The tempo dials it back a notch, and some new tools to the SAO arsenal—low synthesizer sweeps and futuristic sound effects—help to fill in the backdrop. This isn’t them fireworks; it’s the slow burn. Not a sugar rush injection, but instead the type of vibe to steep one’s self in, to take in over the long haul and luxuriate in. Crucially, this is also a brilliant fit for Eir Aoi. She gets to show off gravitas, act dramatic in that operatic kind of way, and she’s far better at these moves than encroaching on LiSA’s domain. Also, not for nothing, but I absolutely adore the bridge. It’s the simplest one in any of the OPs by far, but that is part of the reason why it works so well. Just bring the song to a halt, lay on those minor chords thick with copious amounts of electronics skittering by, then start bringing back the beat with the string symphony, and bask in the utter perfection of mood. Yet another ingredient that makes for compulsive listening.